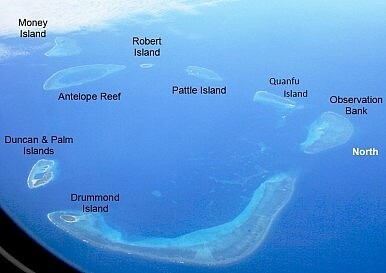 The Crescent Group of the Paracel Islands. Over a year old, China’s cruise service to the Paracels is going strong. The Chinese operator of a cruise line sailing to disputed South China Sea islands is revamping its operations to shorten the voyage, Xinhua reported this week. The change gave Chinese state media a reason to reflect on the successes of the cruise program. According to Xinhua, since the cruise route opened in began in April 2013, Hainan Strait Shipping Co. has carried over 3,000 tourists from Hainan Islands to the Paracels in the South China Sea. The route is serviced by a single ship, the “Coconut Princess,” which makes monthly or bimonthly trips carrying around 200 tourists each time. Originally, the voyages began in Haikou, the provincial capital of Hainan Province, and took about 20 hours to reach the Paracels. Starting on Tuesday, though, Hainan Strait Shipping has moved its departure point to Sanya, on the southern coast of Hainan. Now the journey to the Paracels takes only 12 hours. Cruise passengers visit the islands of Yinyu (also known as Observation Bank), Quanfu and Yagong, all of which are located in the Crescent Group of the Paracels. An executive from Hainan Strait Shipping told Xinhua that the tourists “can play beach volleyball, dive, fish and take wedding photos” after reaching the Paracels. The entire cruise lasts four days and three nights. While the media coverage of the cruise focuses on the tourism aspect, there’s undeniably a political layer as well. By running regular cruises to the Paracels, China helps solidify its claims to absolute administrative control over the region. Cruise ships feed and house their tourists, allowing China to bring in large groups without the massive infrastructure build-up that would be required to house them on land. Further, the presence of cruise ships provides a novel wrinkle to China’s inclination to use non-military vessels to patrol disputed regions. Beijing generally prefers to use Coast Guard vessels or even nominally civilian fishing boats to stake its claims; a cruise ship, unarmed and full of civilians, is even less likely to become the target of an aggressive intercept from other claimants. When the cruises began last year, Vietnam objected stongly. Thanh Nien News, a state-affiliated paper called the cruises “the latest in a series of unilaterally provocative actions in the area.” Official protests from Hanoi were ignored by Beijing. China, which does not recognize Vietnam’s claims to the Paracels, insists that its tourism activities in the region are of no concern to any other country. As a sign that China is aware of the political ramifications of the cruises, however, when the voyages first began passengers were required to be mainland Chinese citizens. Foreign passport holders, and even Chinese citizens from Hong Kong and Macao, were turned away without explanation, the International Herald Tribune’s Rendezvous blog reported. In addition, on the first trip, around 200 of the passengers were government officials rather than actual tourists, IHT noted. Xinhua’s report on the new cruises also suggested that the availability of official tourist programs in the region would help discourage “unauthorized, and potentially disastrous, tours” to the region. In the absence of official options, a handful of fervent nationalists from China have attempted to find their own way to disputed territories, often endangering their own lives in the process (this year’s failed attempt by a Chinese chef to fly a hot air balloon to the Senkaku/Diaoyu Islands provided a particularly memorable example). Xinhua implies that the cruises could cut down on such activities in the Paracels by providing an official (and regulated) alternative. China isn’t the only country that sees the potential to use tourism as a means of legitimizing control of disputed regions. The Philippines is also interested in remaking its holdings in disputed areas of the South China Sea into tourist destinations. General Gregorio Pio Catapang, the chief of staff of the Armed Forces of the Philippines, told reporters that he would like to create a cruise service visiting the disputed Spratly Islands. Catapang cited China’s own cruise service as a precedent for a similar action by the Philippines. Tourism is joining fishing and oil drilling as an economic way of exerting control in disputed regions — and bringing economic benefits to the host country. Chinese policy in the South China Sea increasingly focuses on boosting its civilian presence on disputed islands. China: Vietnamese Boats Rammed Our Civilian VesselsVietnam, China Clash Over Oil Rig in South China SeaChina to Foreign Fishing Boats: ‘Get Out’ of South China SeaVietnam Investigates Fishing Boat Sinking in South China SeaChina-Philippines Relations: Can the 'Rainbow' Last?